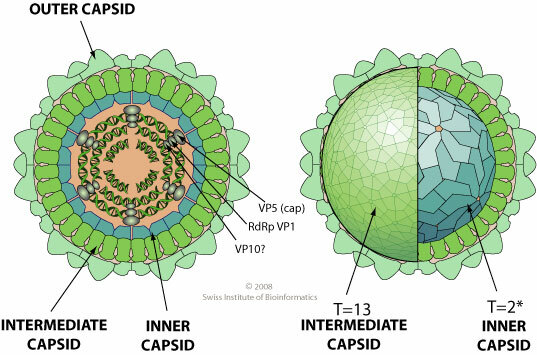 Non enveloped, icosahedral virion with a triple capsid structure, about 60-80 nm in diameter. Pentameric turrets sit on the outside of the innermost capsid. The intermediate capsid has a T=13 icosahedral symmetry, the inner capsid a T=2* icosahedral symmetry. Segmented dsRNA linear genome. Contains 12 segments coding for 13 proteins. Segments size range from 675 to 4,350 bp and genome total size is about 29,000 bp (CTFV). The dsRNA genome is never completely uncoated, to prevent activation of antiviral state by the cell in response to dsRNA. The viral polymerase VP1 synthesizes a capped mRNA from each dsRNA segment. This capped mRNA is translocated to the cell cytoplasm where it is translated. VP9 protein is expressed via RNA suppression of termination. ETYMOLOGY Colti: from types species "Colorado tick fever virus"
GEOGRAPHY CTFV: Western United States and Canada.